In the late 1800′s, as cities grew larger and more crowded, the automobile become more and more of a necessity to offset the unhealthy and malodorous pollution from horses. Each horse could produce upwards of 35 pounds of waste per day, not to mention the macabre detail that dead horses littered the cities in the thousands per year. In 1903, William Phelps Eno wrote the first traffic code in the world for the city of New York and very soon the world was introduced to the Stop sign. Several years after that, Henry Ford put the modern assembly lines into practice, thus making the automobile cheaper and accessible to a wider range of consumers. This all led to the prevalence of automobile use and ownership facilitating the migration of people from cities to newly created suburbs post-World War II. Now, in year 2011, we are at a similar crossroads. The trend has reversed; people are moving back to cities to decreasing space and resources. The streets are once again congested and, as a result, generating unhealthy emissions. Not only that, but the cost of filling up the gas tank just keeps skyrocketing. In the United States, CAFE (Corporate Average Fuel Economy) standards, enacted in 1975 as part of the Energy Policy Conservation Act, were updated in 2007 by the Bush Administration with the mandate to improve fuel economy (and therefore reduce tailpipe emissions) to 35mpg by model year 2020. President Obama announced another agreement July 29, 2011 to increase fuel economy to 54.5 miles per gallon by model year 2025. Automakers have responded to both federal mandates and consumer demand by introducing hybrid and electric cars. In the past few years, more and more green leaf-badged vehicles have been plugging in and quietly zipping, emissions-free, onto main Street. But is this enough for burgeoning urban environments and ancient infrastructure? Does this even begin to address the complex problems and needs of modern urban transportation? 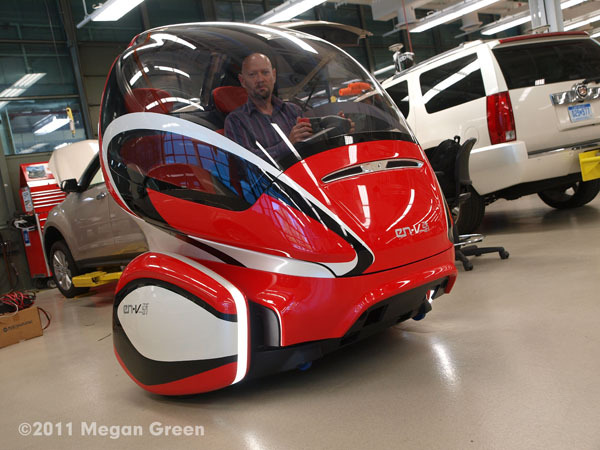 The thinking folks at General Motors Research and Development think not. To navigate modern urban spaces, vehicles should be a little more innovative than powering a car on a lithium-ion battery in the same old automobile size and shape. 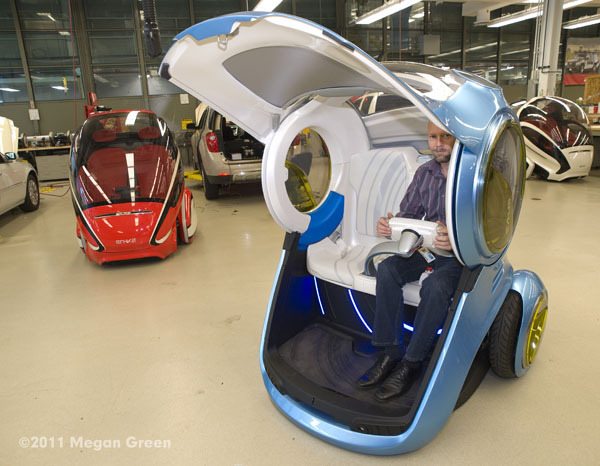 So in 2010 at the Shanghai World Expo, GM presented the EN-V (Electric Networked-Vehicle) concept, a product of three global GM design teams, as an inventive answer to personal mobility.